It has been about a week since the online store was opened and I am glad to say that all orders received have been successfully shipped from both Rocast Models and Rocast-Digidecals without problems. I want to thank you all for the trust, for the patience and support for my work and my items. Starting this new online store represented the preparation of all the items that I created so far, as I wanted to open the store with all the items in the catalogue, this took me a very long time but I kept on pursuing my wish. Currently, some items sold out during the last days, but I am already working on new stock units and also hoping to continue with future projects. From this point, items will be added to the store regularly and will do my best to keep them in stock. The first units I am planing to restock are the Neo engines, AST-1, catering truck, and so forth. I would like to remind that Rob is moving his workplace thus the printing of the decals will be on hold for some time until he is established and printing can resume, this time with the rest of the decals available. In the meantime, I would like to do a few more liveries for the A350. I am finishing the painting/decaling guide that I started together with the A350 China Airlines pheasant livery, so I hope that this guide can be helpful to somebody. Thank you all for your time and interest! It has been quite some time since my last post, but I have been working on the A350 that I wanted to build prior launching the new online store. This project is serving as an example for a guide that I am currently writing where I explain tips form errors I learned in the past on painting and decaling, and also to test/show some of the decals we have been working on. This is a photo of the decaling process, I am hoping to apply the final clear coat this weekend, so it will be finished soon. The store is being fine tuned even more, tests have been done with good results and there has been a lot of artwork adjustments for the decals recently. Material is still on the way, but I keep my plan of opening the new store during the second week of this month. I know I repeat myself quite a lot on the stock units preparation, but I am glad to say that this will most probably be the last week that I need in order to finish all the photo etched parts. 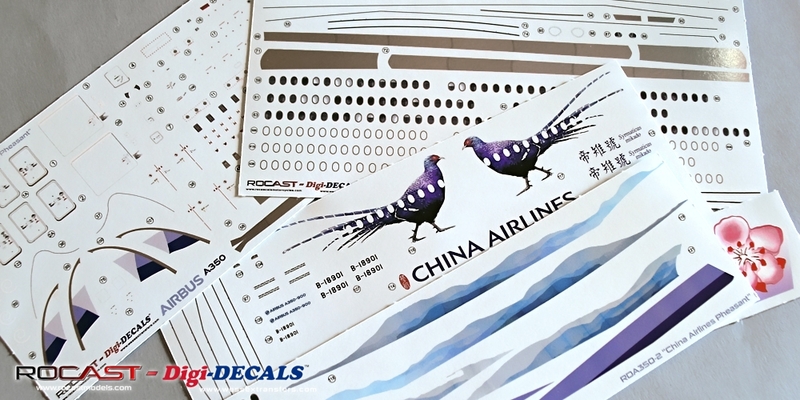 I am also about to prepare a PDF tutorial-guide-example on the process of painting, decaling and clear coating the A350 in the China Airlines special scheme featuring the Mikado pheasant. I will be sharing few photos of the process on the blog prior the creation of the file. Photo etched parts aside, I have also been working on the A350 decals with hopes they could be available for the store opening. I am still working on some of these liveries, and I still have to write the guide on using the interior window decals but I am on it. I am going to update the site the next weekend! Lastly, I would like to write a message for a visitor; I have received a message, but it is possible the email address given is not valid; every time I try to reply to the email address I was given, I get a mail delivery error, please Andreas DUDA, if you are reading my message here, try to contact me with another email address as I get an error writing to the email address that was indicated in the contact form. Thank you! I am glad to write this entry to say that practically all the stock is done now. There are still the photo etched parts to be done, but everything is being made step by step. It really took me a very long time to complete these stock units, there are several parts for each item and I had to make new molds on the way, in most cases, changing the distribution of the parts in order to improve the molds and avoid wasting material (because of errors) and time. Not only I made new molds for these reasons, but for the most important; to keep the parts as crisp and clean as possible. With time, molds degrade and so do the resulting resin parts, in order to keep as clean and sharp parts as possible it’s important to renew the molds from time to time. As I mentioned, every GSE model has its own parts, so far I’ve made about 900 bagagge, the reason being that there are a total of 42 baggage for every baggage cart set and 7 for each belt loader model. In the meanwhile, I have also tried to improve the molding of the NeoPW engines, and although it was a success for small quantities, it wasn’t viable as only one out of 8 engines came out fine. Therefore, I decided to go for the conventional method of two halves which I think isn’t such an issue, it is actually better than having to fix misalignment problems along the whole engine. I will update some photos of the engine soon. Speaking of the Neo PW engine, it seems that more and more airlines are chosing the LEAP-1A model over the PW1127G, so I am really hoping to make a LEAP-1A version as I am also working on livery decals. There may not be huge visual differences between those two engines, but for those who have seen both engines carefully, they are quite different. Still, I may use the PW as a base and fully rework the cowlings and the pylons to make the LEAP-1A, this will hopefully save me the troubles of starting from 0 as I did with the PW and be able to make this engine in shorter time. 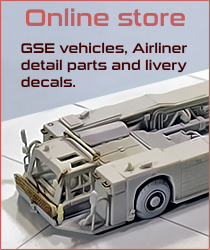 I am also working on the A350 liveries and working on the new online store. The A350 liveries that will be available once the site is open will be: Generic decals, China Airlines “Pheasant”, Cathay Pacific, Delta Air Lines and Singapore Airlines. I expect to make more in the near future, but I am planning to make more liveries for the A320Neo as well. As the stock units are being finished, I would like to do a quick out of the box build with the A350 in order to fully test the interior window decals and another test that has to be done for the cockpit windows, alongside the build I plan to do a full tutorial from preparing the fuselage halves to decaling with these livery decals as well as giving as many tips as I can from errors and experiences I had while painting and clearcoating. There are still things to be done, but I am progressing forward one step at a time. As you may know, I haven’t been able to update the site with news on the projects because I have been working on the stock units also on the weekends. I not only have been working with these, but have dedicated quite a lot of time to design the first A350 decals after I made some for the A320 model as well as fine tune the new online store. These are not a simple decal set; the decals include several details and we tried to include a new feature that I would really like to test on the A350. I am hoping to receive the first A350 decals from Rob soon, and will do a review/tutorial with an “out of box” build to be used as a test/example with hopes for a good result on this new feature. I do like airliners, so I also took my time to design profile views as detailed and realistic as possible. I grown fond of drawing profiles that later can be included in the instructions rather than just making simple plain illustration, so for me this will be a little different concept. In fact, in most cases, prior starting to design the decal artworks, I start with the profile to have a general view of the aircraft and have an idea of what decals need to be done. The stock is currently at about 47% done, the most time consuming items have been done, thus from now on, the remaining items won’t take me that long to make. The main reason why the online store is not open yet is because I wish to have at least most if not all items available, since it would make no sense to release an empty store. I would like to take this chance as I am writing this post, to comment on what will be the current and upcoming projects that I would like to undertake. As you have been able to read from the last couple entries, I plan to do a detailed set that will include a cargo deck compartment, the nose door and side cargo door for hopefully both, the 747-8F and 747-400F. Although I have not “officially” started to work with it as I haven’t done any cutting yet, I did gather all the information I need to start and have been doing a plan, which is something I always do to schedule what to do and how to proceed. The main issue will be the work on the deck floor, not because the floor itself but because Revell’s kit has the gap on the wing root and although the floor level is correct where the wing joins, the problem is the thickness of the plastic, thus if that is not fixed, the floor would not follow the level. A litle complex thing to explain without any visual reference, but I will show this in later posts of the build progress. Charlette tug: Some time ago I was contacted on regards this particular tug, and after having made the MA50, I always wanted to make a new improved tug with more details. The Charlette tug will be one of the upcoming works as I was asked if I could do this in 1/144 scale and I currently have good references for this project. Pushback tug GT-110: Most recently I have been mentioned about this pushback, and after a little research I found it is used for several airlines. What attracts me to do this tug is that unlike the AST-1, this pushback makes use of a bar, and in some ways it is a smaller model. It has always been on my plans to make a smaller pushback tug in the future, and since I have some references already, I am really excited to start this. One of the goals I have for this pushback are the wheels; I want to improve the tire detail and would like to make the wheels to actually turn. This project may also lead me to make separate decals of airline logos in different sizes in order to fit to any GSE model, something similar like I currently do for the LD3 containers. So in this way, anybody could have a ramp of a certain location with certain logos on these GSE vehicles. Hydrant dispenser Meteor: As I have done in 1/200 scale (and yet to be re casted) I would like to do this model also in 1/144 scale. I will be making the “Meteor” platform type since I have good references of it, and use the Eurotruck cabin that it’s already included in the catering model. The big goal for this would be to make it adaptable to any airliner wing, meaning that the nozzle/bridge will have to reach the wing height from a B737 to an A380. Bigger cargo loader: The last GSE on the list I want to make is a bigger cargo loader. The purpose of this model is to make it suitable for the 747F cargo detail set, since the Commander FMC15i model cannot reach the required height as it also happens on the real versions. In this case, I also want to take the chance and take what I’ve learned making the Commander model in order to make a better cargo loader, with as many details as I can and with a better sill system. I still have to consider wihch model to make and if I will be doing double sill system for the bridge or single sill. These are all the upcoming GSE models I would like to make, but I also have in mind some others that I save for the future. The list may be a bit long, but I will do one step at a time and focus all my efforts in each model. Lastly, the 1/12 B737NG cockpit project is not abandoned by any means, I will be working with it as regularly as I can and will be making things by phases. Doing it this way will be the only way to keep things in order, since there is a lot to do, so if I do the MIP, I will be making the buttons of the MIP panel instead of doing the buttons of every panel. One area or subjet at a time, taking every area as if it is one project. That is all for now, as I am progressing with the stock units and the online store, I will inform of its opening at least two weeks beforehand, I am hoping that everything will really work out well, now it’s time to get back to work.